Owner Tania Cordes’ business background, including an MBA from Harvard, reinvigorates the iconic Kato Ballroom. Herb Martinka, who opened the Ballroom in 1946 and operated it through 1982, kept the space packed with regularly scheduled dances and events that drew in a thousand or more patrons per night. This early success helped Martinka rebuild after the Ballroom burned down in a fire in the early 1950s. Besides wildly-successful dances throughout the sixties and seventies (a local Facebook group dedicated to “Mankato Memories” contains hundreds of comments from residents reminiscing about the Ballroom’s heyday, including things like “Oh the lies we told our parents to get to those dances!”), the Kato Ballroom is well known for its close brush with ill-fated musician Buddy Holly. On January 25th, 1959, Holly, Ritchie Valens, and J.P. “The Big Bopper” performed at the Kato Ballroom as part of the “Winter Dance Party” tour. Eight days later, all three artists perished in a fatal plane crash near Clear Lake, Iowa, just one hundred miles south of Mankato. The incident inspired Don McLean’s 1971 song “American Pie” and February third was deemed “The Day the Music Died”. According to the Minnesota Ballroom Operators Association, a nonprofit organization supporting ballrooms, bands, and old-time music promoters, Minnesota has more active ballrooms than any other state. However, the number of these historic buildings still in operation (or even existence) is rapidly dwindling. Approximately twelve historic Minnesota ballrooms are still in operation, down from about 180 statewide. Ballrooms like the one in Mankato used to be just a short drive for residents living in rural areas, providing a chance to gather, socialize, and meet friends and future spouses. The largest concert at the Kato Ballroom featured the Everly Brothers, drawing over 2,400 people on November 22, 1964. Whether polka, big band music, or rock ‘n’ roll, ballrooms have occupied a special place in the history of the Midwest—one that is quickly evolving. Enter Tania Cordes, who purchased the 26,000 square-foot Kato Ballroom in 2014. 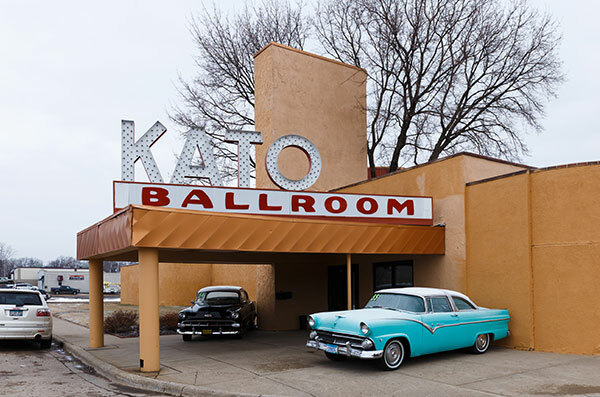 The Kato Ballroom had been owned by Cordes’ ex-husband’s family for more than 30 years, but it wasn’t until a conversation around 2012—when Janet Sell decided to retire—that Cordes set her sights on revitalizing the local hotspot. Cordes has a background in business, with a degree in economics from Colgate University and an MBA from Harvard Business School. Her past job titles include things like “Analyst,” “Strategy Associate,” and “VP Institutional Sales.” In the late nineties she was part of a Chicago-based Internet start-up that offered insurance to small businesses. After taking ownership of the Ballroom, Cordes leveraged her business skills and background to revitalize it. “I’m very careful about all of my margins—my numbers. I do all my own books, all my own taxes every month, so I know exactly where we stand all the time,” she says. A glance through the Ballroom’s online calendar and social media posts reveals a lot about how the clientele has changed over time. 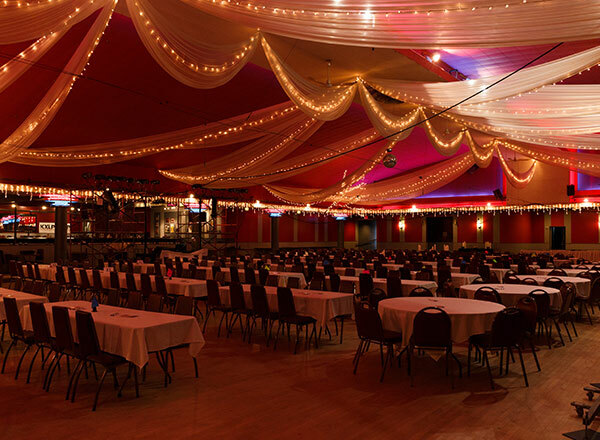 While they still serve as a dance hall for big bands and polka nights, the Kato Ballroom hosts theatre performances, fashion shows, fundraising events, high school proms and formals, hip hop shows, album release parties, symphony performances (“Pops at the Kato”), class reunions, corporate lunches, and business meetings. Tribute shows have been particularly successful, including performances celebrating The Eagles, Pink Floyd, Elvis, Fleetwood Mac, and Queen. Cordes estimates that the Ballroom held about a hundred events last year, compared with around twenty the first year she owned the place. Some, like the Minnesota Pheasants Banquet and the Mankato Clinic Holiday Party, are repeat customers who have been booking with the Ballroom for years. Others are businesses that have come back to the Ballroom after opting for alternative spaces for one reason or another. Cordes credits the Ballroom’s success to the renovated space and food, but it is clear that her enthusiasm and personality have played a major role in bringing more business into the historic building. “I’m a huge extrovert so I get my energy from being with people. This business, to some extent, suits me perfectly,” she says. In 2016, Cordes received the National Travel and Tourism Week Attraction Award from Visit Mankato for going above and beyond in providing outstanding service to visitors in the community. In May of 2017, Minnesota Public Radio visited the Kato Ballroom to celebrate their 50th anniversary, featuring interviews, on-air broadcasts, and a live performance by Minnesota punk rock band, The Suburbs. Another highlight was The Buddy Holly Story Dinner Theater, presented by Merely Players in 2016. Over 1,800 people visited the Ballroom over four days for four sold-out performances. The musical would have normally been held at the Lincoln Community Center, but Cordes credits the historical significance of the Ballroom, and one of Holly’s last performances there, with pushing the production over the edge in terms of success. At that point, Cordes faced some doubters, but she was armed with the survey data—a signature of her strong background in business. Bandwagon started charging a $5 cover fee, which people happily paid. The dance was extended to three hours, and a rotating menu was added. “I mean, I have people who call to find out what’s on the menu now, whereas we used to serve the same meal every time,” she says. The dances now bring in anywhere from 200-300 paying customers, with show ratings up to 16%. The Ballroom currently relies on a part-time staff of about 25-30 people who get called in based on the needs of different events happening in the space. Cordes estimates that she works around 70 hours a week, depending on what’s scheduled. Her full-time Operations Manager Larry Bowers has worked at the Ballroom for 35 years, since about the time the Cordes family purchased it from Herb Martinka. “I try to find time for my personal life because I’ve got four kids. That was one of the biggest adjustments—going from being a stay-at-home mom,” says Cordes, who has children age seven, nine, fifteen, and seventeen. “I would say I feel a fair amount of guilt about leaving them and not doing what I used to do. It’s taken me a while to get over this because I was raised by a mother who stayed at home… Six nights of dinner theater means that one of us—Larry or I—is here from before the first person arrives until the last person goes home. It can be stressful, hard to have work-life balance,” she adds. However, personal attention seems to be just one of the many benefits of working with the Kato Ballroom. Cordes has heard many a horror story from brides about venues upcharging or being unresponsive. “We’re not a big corporation,” she says. “Basically, if you ask me, I can tell you yes or no.” Because she handles all sales for the business, customers speak directly to her from the beginning and throughout their event. Another benefit? The Ballroom doesn’t have a lot of hidden costs. “We’re straight forward with what we charge for and there isn’t going to be a nightmare surprise bill at the end,” says Cordes. Best of all, Cordes focuses more on building authentic relationships than pushing the hard sell, which is important when you’re operating in a tight-knit community like Mankato. “I can only sell what I really believe in,” she says. “I can tell a bride why this is the best place to have their wedding. 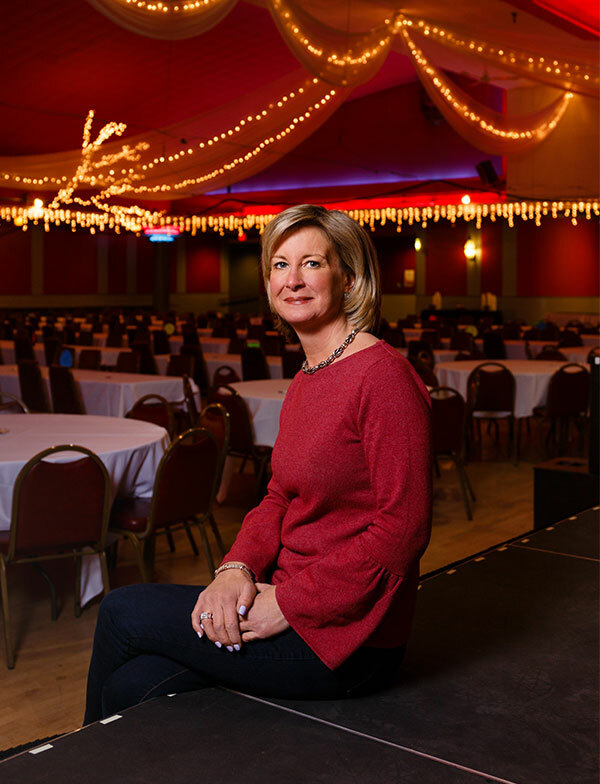 But that’s because I really believe it.” With her solid background in business, and infectious enthusiasm for event planning, Cordes is on track to restoring the Kato Ballroom to its former glory—and then some. On the first Monday of every month, the Kato Ballroom hosts the KEYC News 12 Bandwagon Show. Doors open at 5:30 p.m. for a night of old time music and dancing from 6:30 to 9:30. An $8 cover charge will get you in and drinks, sandwiches, and snacks are available for purchase. Main Ballroom, maximum occupancy 1,686 — Built in 1946 and rebuilt in 1954, the Main Ballroom boasts three bars and the second largest dance floor in all of Minnesota. Perfect for weddings, corporate holiday parties, bands, and theatre performances. Banquet Room, maximum occupancy 186 — Added in the early nineties with its own dance floor, bar, coat check, and entrance off the back parking lot, the Banquet Room can be used for a separate event while the Main Ballroom is in use. Ideal for corporate trainings, seminars, and smaller weddings. Rehearsal Room, maximum occupancy 75 — This small room is off to the side of the Main Ballroom and can be used as overflow area or for parties under 100 people. In 2009, flooding caused water damage that forced Kato Ballroom owners to replace the original dance floor. After reportedly burning up four saw blades cutting the hard maple floor out, workers stumbled upon a well-preserved pack of Lucky Strike cigarettes left behind by the original floor layers. Over 7,500 square feet of new sub-floor and tongue-in-groove maple was put in, and the dancers kept on dancing. A Mankato-based freelance writer and marketing consultant covering food trends, small business, tourism, literature, and the arts.